It’s cocktail hour, but I don’t drink, and I’m at home slaving away at my translation anyway, or I would be if I weren’t writing a blog post. Woops! Anyway, for those of you lucky enough to be living it up out on the town, here’s something you might like to wear… I made this ages ago out of an obi but didn’t have a picture of it until now. It’s very short 1) because I like mini-things and 2) because I had made another skirt and a dress to begin with and this little number was made from the leftover parts. Funnily enough, looking at the skirt that I made first, it looks the same length as the mini one that I’ve got on, but that’s just because the model’s legs are so long! I used bits of other kimono as well for the dress to make the ruffles on the side and the skirt part – it’s the bodice that was originally the main section of the obi. When I was looking for the pictures I found some others from the shoot – yes, I actually got the lovely Gen Kay to shoot a few of my pieces while I was still living in Tokyo. Here’s Gen snapping Rie around the corn er from Nicole’s apartment – Nicole lent us her lounge room so Rie, the model, could change. I love this shot of Nicole being a bit bossy and telling us where to shoot. 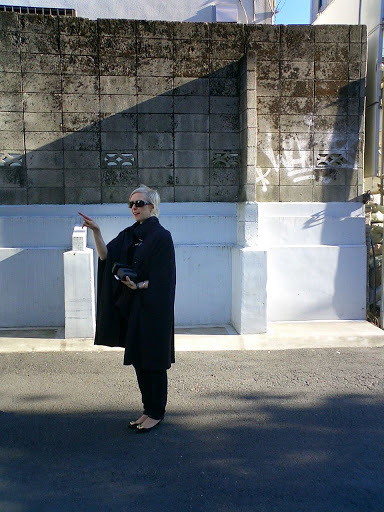 She’s in her Yves Saint Laurent cape and carrying her Prada bag just scouting locations around the ne ighbourhood…. such a fashionista and the only person I know who has worn a YSL cape to go mountain climbing. Gen, Nicole and I used to hang out all the time in Tokyo when Gen was over for work… in fact I think I saw her more there than I do even though we’re both living in Melbou rne now! gorgeous and very glam! I love the dress second from bottom – oh if only I had long, coltish limbs! I LOOOVE that red dress in the 2nd picture…. Thanks!! Hopefully all these lovely comments will spur me on to actually start making and selling stuff again.. it's all languishing in the linen cupboard at the moment! aw thanks for coming to MY blog! !I love your dress!